Trumpis threw out the idea of ‘Indo-Pacific dream’ without explaining how to realize it. After U.S. President Donald Trump made his keynote speech at the Asia-Pacific Economic Cooperation (APEC) summit held in Vietnam, Ian Bremmer, president of the political consultancy Eurasia Group tweeted: “Trump has the moral compass of Kissinger but without any of the strategic vision.” Ironically, Trump did specifically consult with Henry Kissinger in the Oval Office ahead of his trip to Asia. In his speech on November 10, Trump threw out the idea of an “Indo-Pacific dream,” centered around the notion of a “free and open Indo-Pacific.” The dream has been defined as Trump’s “post-pivot strategy” by some policy experts. However, a close examination will show that Trump’s strategy — if there is one — is half-baked, without any specific plans or detailed steps, or even an inspiring big-picture vision. According to Amy Searight, director of the Southeast Asia Program at the Center for Strategic and International Studies (CSIS), a Washington think tank, former U.S. President Barack Obama’s “pivot to Asia” strategy had three basic pillars — security, economics, and a focus on Southeast Asia. 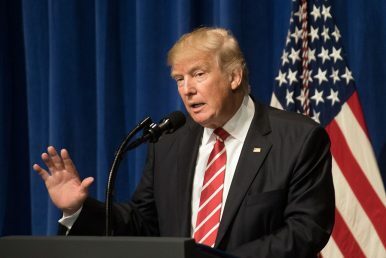 Particularly regarding economics, Trump claimed that “Economic security is national security” and it is “vital” to the U.S. national strength. It’s obvious that the Trump administration’s ultimate goal is to protect the United States’ own “economic security” rather than that of any other nations. Such a nationalist stance should never be described as a regional “strategy.” If Kissinger were in Trump’s shoes, even if he agreed with the point of view, at least he would never have said it aloud in front of a group of world leaders gathered for a multilateral economic summit. As for Southeast Asia, the focus on the region under the previous “pivot strategy” has been intentionally abandoned under Trump’s administration. The very term “Indo-Pacific dream” has made it clear that the United States aims to let India play a significant role in balancing China’s power in the Asia-Pacific region. Trump’s last-minute absence from the East Asia Summit is a reaffirmation of his administration’s decreasing interest in the region, compared to the Obama administration, at least in the eyes of Southeast Asian nations. Security appears to be the strongest pillar of Trump’s new strategy. Senior officials from the United States, Japan, India, and Australia just held a quadrilateral meeting on the sidelines of the ASEAN summits. The latest development can be seen as the most solid progress pushed forward under Trump’s notion of a “free and open Indo-Pacific.” Yet, as The Diplomat’s Ankit Panda pointed out, the four nations haven’t really reached consensus, based on their separate statements. The fact that India intentionally omitted explicit reference to “freedom of navigation and overflight, respect for international law, and maritime security” — some of the most important issues on Washington’s security agenda — shows that India isn’t ready to confront China in the Asia-Pacific region, as the United States has hoped. Against the backdrop of Trump’s constant emphasis on an “America first” policy, a security-only strategy can hardly make other nations feel secure enough to cast their lots with the Trump administration. Trump's Indo-Pacific dream focuses on reciprocity, as well as economic and military security.